Back Row: Ernest and Harold Gustafson. 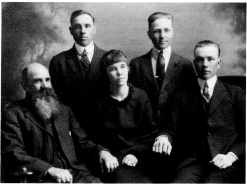 Front Row: Father, Alfred Gustafson, Hilda and Bert. He attended Whirlpool school until it closed and then to Onanole, Minnedosa Collegiate, graduating from the Erickson Collegiate. 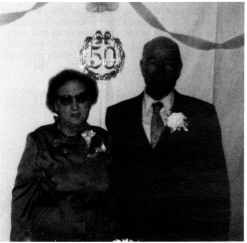 Eric married Judy Strong of Langruth, Manitoba. They reside at Dauphin where Judy owns and operates, Touch of Beauty Hairdressing Shop in Dauphin Market Place. Eric is the Hospital Ad­ ministrator of Gilbert Plains, Manitoba. Eric and Judy have a daughter, Tiffany. Bert, second eldest son of Alfred and Amalia Gustafson was born April 26, 1903, on S.W. 5-17-18W in Westmount area and attended Crocus Hill school. The choice of a career was not hard to make, it was either to stay at home and help on the farm or get a job somewhere. In 1921, Bert left the Rural Municipality of Clan­ william with his father and family to farm in the Smoland District, south of Minnedosa. In 1926, he returned to his father's homestead S.E. 18-17-18W in the Westmount district. His father gave him four horses and enough machinery to work the land. In 1932, Bert married Gudrun Gudbransen, daughter of Anton and Ragna Gudbransen, who later took the surname of Antonsen. After her father's death, Gudrun's mother Ragna made her home with them until she passed away in 1933. They lived in the log house and farmed for six years, a son Alvin and daughter Bernice were born there. In 1939, they moved to Erickson and the same year Gudrun's sister Ruth Holmberg gave birth to a baby girl, Emilie, and was not well enough to care for her, so Bert and Gudrun took her into their home and raised her as one of their own. Gudrun's sister Ruth passed away in January, 1940. Bert worked in bush camps in the winter and for Wells Construction during the summer. In 1943, Bert enlisted in the Armed Forces during the Second World War. He served in the Royal Canadian Army Medical Corp in England and while on their journey to Italy, the ship was torpedoed, all their belongings were lost but no lives. He met two hometown boys, Lloyd Bergeson and Archie Wilmot in Italy. Bert returned to Canada on June 11, 1945, upon his return, he continued to work in the Supply Depot until his discharge in 1946. Bert purchased the Nels Johnson home in Erickson where he moved his family. He had not seen his little daughter Janet, who was not born until after his departure for the Armed Forces. Bert worked for Nels Johnson in the Well drilling business and then on the Elevator Construction. In 1961, he was employed as a Commissionaire at the Shilo Military Base until his retirement in 1972. In 1966, Bert and Gudrun moved to Brandon, Manitoba, where they presently reside. While in Erickson, they were members of the Erickson Legion and Auxiliary of which Gudrun is a Life Member. They were members of the Bethlehem Lutheran Church, Erickson. Gudrun and Flora Ehlin organized the Bethlehem Lutheran Starlights. She taught Sunday School for fifteen years, helped with Vacation Bible School and was Secretary-Treasurer of the church for several years. Over the years, she has entered handicraft articles in fairs across Canada winning many top prizes. Bert and Gudrun are members of the Redeemer Lutheran Church, Brandon, where their family hosted a Fiftieth Wedding Anniversary party for them in 1982. They have fond memories of the years spent in the area.